Fall is here and winter is right around the corner. Now is a good time to do a little home maintenance both indoors and out. This maintenance checklist will help you get started inside. · Clean closets – You can quickly determine if your closets need a little attention with two easy tests. Can you close the closet door easily? Can you see any floor space? If you answered “NO” to one or both of these questions, it is time to get organized. Begin by clearing out any items that you don’t wear or use any more. Donate what you can to charity Make room for your winter wardrobe. Pack summer clothing and other items and store them elsewhere. Broken items or gloves and shoes that are missing their match should be thrown out. Likewise with clothing items that have broken zippers and other flaws that cannot be repaired. 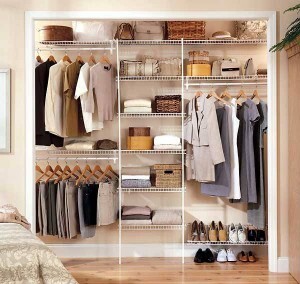 Add compartments and organizers to your closets at different levels to utilize more space. Finish one closet before you move on to the next one. · Maintain Large Appliances – With the holidays coming, you need to make sure your appliances can handle the demands you place on them. Pull your refrigerator away from the wall and clean the condenser coils with a vacuum cleaner and brush attachment. Also, clean the lower front grille. Thoroughly clean the oven and stove. Freshen up your garbage disposal by packing it with ice cubes and ¼ cub of baking soda. Turn it on and let it run until the ice grinding noise stops. Then pour a quart-size pot of boiling water down to rinse. · Maintain Woodwork – This is a good time of the year to repair woodwork because indoor air is at its driest. Re-glue any wood trim or broken pieces or parts of furniture such as a wobbly arm on a dining room chair or a loose piece of trim around the entry door. For information about outdoor home maintenance review last week’s posting, Outdoor Fall Home Maintenance Checklist.